So, I've been keeping a secret (or two...eek!) BUT today is the day to finally let you know about one of them: that I have been working hard with 36 other AIP bloggers to produce The Paleo AIP Instant Pot Cookbook. We started on this project MONTHS ago and today is the day you can finally get your copy! SO EXCITING! When I first saw that there was a recipe for chocolate cake in the cookbook I was like, hold up, are you sure you wrote that for this cookbook? How in the world do you cook a cake in a pressure cooker?! Turns out that the Instant Pot is WAY more versatile than I ever realized. You can make cakes (recipe below!) You can make sauces. You can make condiments. You can make broths (read my general tutorial here). You can cook all the proteins. You can make delicious offal (ahem - are you actually eating offal every week like you're supposed to?) And you can make a surprisingly versatile array of desserts. I have the 7-in-1 model and even though I use it multiple times every week I have learned that I have been seriously underutilizing it! 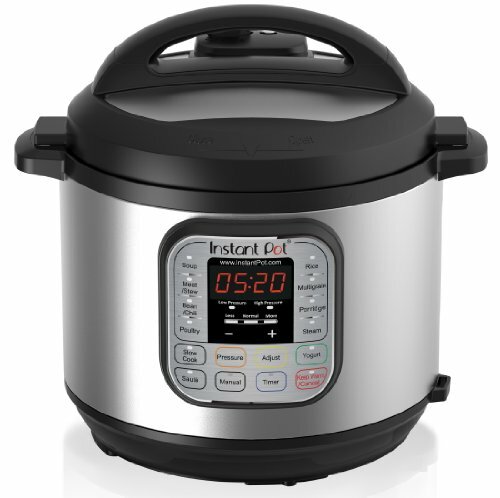 If you do not already own an Instant Pot pressure cooker, you really need to get one ASAP. It is worth it for the never-ending supply of rich broth (that consistently gels) alone. So when you add on top of that the ability to make FAST FOOD with little to no prep work needed (you don't even have to thaw meat first...) and you have what I think is seriously the #1 appliance to have in your healthy kitchen, especially if you are on the AIP. A good food processor is #2. The Instant Pot also functions as a slow cooker, too! But note that all of the recipes in The Paleo AIP Instant Pot Cookbook are written using the pressure cooker function (so they are SUPER FAST to make). Note that the 6-in-1 model is still an extremely awesome product and usually costs less than $90 on Amazon, so if you're on a tight budget you can opt for that model instead. You'll be able to make all of these recipes in it! Click the big button below to be taken to the page where you can purchase a copy of the eBook. I am sharing SIX RECIPES in this eBook. Yes, SIX!!! That's the most any blogger was allowed to contribute, and I wanted to give you the most that I could since I love ya that much! Just take a peek at everything that is inside this eBook... you are not going to be bored with food on the AIP anymore! 141 recipes is A TON OF RECIPES! All conveniently located in one place on your phone, tablet, or computer in a PDF format. Now, on to the recipe preview from the eBook! To give you a taste of what's inside, I'm sharing this incredible recipe for "chocolate" cake. Once you get to the reintroduction phase this recipe could be the one you use to test cocoa powder, too! Or you can use the chocolate pudding recipe I developed specifically to reintro chocolate. ENJOY this preview and the full eBook! This recipe for "chocolate" cake is, amazingly, cooked quickly in the Instant Pot pressure cooker. It was created by Samantha McClellan from Sweet Potatoes and Social Change. Shared with permission from The Paleo AIP Instant Pot Cookbook. Lightly grease three mini fluted pans or ramekins with additional coconut oil. Pour the batter into prepared pans until they are about ¾ of the way full. Pour the water into the Instant Pot® and add the steaming rack. Place the pans onto the steaming rack. Garnish with coconut cream, coconut flakes, or fruit and serve warm.